Look through any list of job ads for web designers and almost all of them will ask for Dreamweaver skills. There's a reason for this: Dreamweaver has one of the largest feature-sets of any web design app. At heart, it's a WYSIWYG page layout program for web pages. Just drag standard elements to your web page from Dreamweaver's many palettes to build your page. 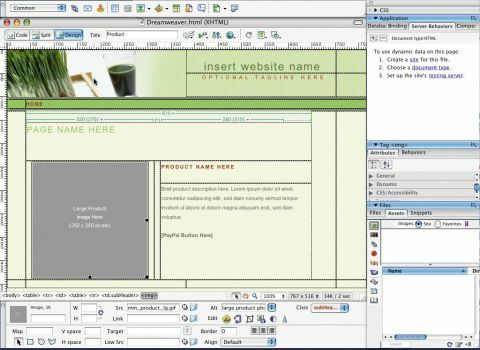 You can do that from scratch, using one of the numerous templates Dreamweaver offers or those available on the web, or by using a 'tracing image' - a graphic that you place in the background of a page and trace over. But there's far more to Dreamweaver than this: if you want to do something on the web and you're not sure what to use, pick this application. As well as the WYSIWYG view, there's a code view that allows you to edit both HTML and CSS files directly. It supports almost all the latest coding standards. It has built-in dynamic web page development tools for interacting with databases and scripting languages, a site manager, a syntax validator, a batch code updater, and a linkchecker. There's also a whole host of other useful minor features, including a photo gallery generator, code completion and a whole set of built-in O'Reilly books for looking up code syntax. There are some failings in the program. The interface is very Windows-like and is harder to use than other programs in our test. Dreamweaver also relies heavily on your knowledge of HTML to help you create the exact layout you want, rather than generating it for you. There's no live preview of your WYSIWYG page, meaning you'll be making frequent trips to your browser to test your coding.